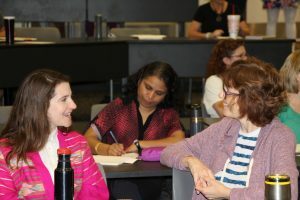 Heart of Texas Writing Project is a network of Teacher Consultants experienced in designing and leading workshop series for Austin Area Teachers in the teaching of writing. We design in-depth professional development that is responsive to teachers and supportive of their growth in process writing pedagogy. in on-going professional development and to build leaders in the teaching of writing. Additionally, Heart of Texas Writing Project Teacher Consultants work in K-12 classrooms modeling the teaching of writing workshop, coaching teachers to design and implement curriculum in process writing, and supporting teachers as they engage in professional inquiry, reflection, and revision of their practices in the teaching of writing. Click here to view profiles of professional development arrangements we have designed and implemented in Austin area schools and districts. Here are a few questions to help you begin thinking. 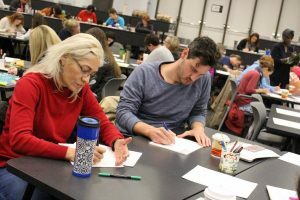 What opportunities have teachers had in the past two years to deepen their knowledge and understanding about writing pedagogy? What is the leadership capacity among teachers in your district for advancing the whole community’s work in writing? How could you support teachers with intensive learning about writing and its teaching across multiple years? What combination of workshops, reflection time, in-class coaching, and courses might set them on a journey toward real expertise? What kinds of community and family knowledge are already part of what students draw upon in their writing? How many opportunities do students have to revise their writing? How will teachers learn how to help students revise the content, not just the mechanics, of their work?